The Montessori Certificate Course primarily addresses teachers working in secondary schools, social pedagogues, students of educational science and others who might be interested. Supporting the development of a human being’s personality is an essential element of every educational theory. The doctor and educationalist Maria Montessori (1870-1952) elaborated an educational theory that is directly geared towards the human being in the totality of his or her developmental stages. Thus, she dissociated herself from many educationalists who only took into consideration the infant, the school child or the adolescent. Nowadays, Montessori Education influences the educational and teaching practice in many nursery, primary, secondary modern, comprehensive and grammar schools in almost every country. which allows the pupils to a limited extent to choose their own topics. The participants of the Montessori Certificate Course will have the opportunity to get to know some of the materials that Montessori herself developed as well as their theoretical background. In the second part of the course the participants themselves will develop an appropriate material for the secondary level. They will learn the relevant criteria of a Montessori material and how it can be employed in school. The course will be accompanied by experienced educationalists from secondary schools. 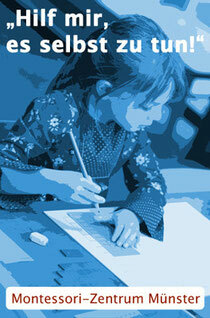 The Montessori Certificate Course takes four semesters. The meetings take place at the “Montessori School Muenster" at Soester Str. 13, 48155 Münster. In order to obtain the certificate, the participants have to attend the sessions regularly, sit in on 6 classes (once in a Montessori Children’s House, once in a Montessori primary school and four times in a Montessori secondary school) and make a material. The fee for the last Certificate Course amounted to 985,- € for students/trainees and 1130,- € for working people (subject to alteration of prices). It is possible to pay in instalments.